Marriott Manila opens its massive new Marriott Grand Ballroom, with over ten thousand square meters of function space and three new dining outlets, adding yet another milestone to the ongoing projects at the growing resort property. Master mixologist and Liquid Chef Kalel Demtetrio showcased his own line of signature handcrafted cocktails to pair with Chef Yana Gilbuena's special Filipino-inspired menu for Salo sa Taal at Villa Tortuga (more on that special lunch here at http://dude4food.blogspot.com/2015/06/salo-sa-taal.html). The uniquely Filipino cocktails added that perfect final touch to a memorable dining experience at Villa Tortuga. Maynila Sour, Rested 87, Night Duty Magtataho, and After Ten...just some of the inventive cocktails created by Manila's finest mixologists. And in one epic bar tour, I get a chance to enjoy these creative cocktails and meet the innovative bartenders behind these concoctions. Diageo recently hosted a bar tour showcasing four of Manila's finest bartenders in their establishments, each one to represent the country in the Diageo Reserve World Class 2015 Southeast Asian Finals in Thailand. The Guardian, the legendary British newspaper, once described Australian minced pies as a true "taste of Australia." The flaky and buttery pastry, premium lean meat simmered and slow-cooked for hours in a thick and flavorful gravy, combine for that distinct, comforting and rustic flavor capturing the very essence of good ol' Oz. A comforting bowl of good and authentic ramen is often a meal in itself. But there are times when you want contrasting favors and textures to complete your ramen. Now, you can pump-up your ramen by pairing it with some flavorful sides for an all-new ramen dining experience. ...and you can find all these at Splice, with its playful reinterpretation of classic comfort food by Chef Ivory Yat. You always discover something new, and the third edition of F1 Hotel Manila's Luzviminda 3 Pistang Pinoy buffet is another eye-opener, blending traditional flavors with inventive, modern twists on Filipino cuisine. Chefs Bruce Lim, Tatung Sarthou, and Sider Tadtad collaborate for F1 Hotel Manila's 3rd Filipino Food Festival, the Luzviminda 3 Pistang Pinoy at F All Day Dining Restaurant from June 12 to 25, 2015. There's just no better way to celebrate Independence Day like rediscovering local flavors from all over the country. And for two weeks, you can savor and enjoy the very best dishes from Luzon, Visayas, and Mindanao in an epic buffet spread, only at F1 Hotel Manila. From the same group behind Hyve, Vyne takes on modern world fusion cuisine with its signature cool touch. Bold flavors and a stylish execution combine for some of the most elegant dishes this side of the metro. The all new Eri Curry Black Series Menu debuts this Friday, June 12, 2015, just in time for the Independence Day holiday weekend. The new dishes will be offered at a 50% discount on June 12, and a 30% discount on June 13. All new dishes and cool discounts for Independence Day combine for a liberating dining experience at Eri Curry. Chef Sau del Rosario celebrates two flavorful decades of culinary excellence and adventures around the world with the launching of his book, 20 Years of Love + Cooking, last June 8, 2015 at Epicurious Manila. More than just a collection of recipes, with many cherished Capampangan family recipes from Chef Sau del Rosario's mother and mentor, the book chronicles the passion, struggle, and perseverance of Chef Sau's phenomenal rise as one of the country's culinary pillars. It is also a thanksgiving tribute to the people who were an integral part of Chef Sau's culinary journey, stories that add so much flavor to the recipes contained in the book. 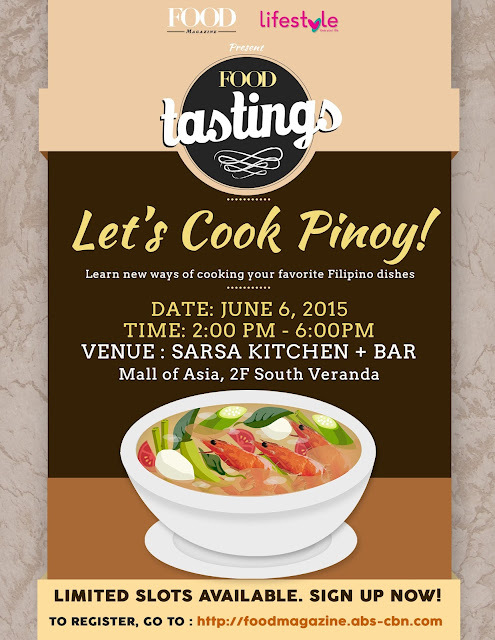 Lifestyle Chef Sharwin Tee and Sarsa's Chef JP Anglo recreate Filipino flavors for the second leg of Food Magazine's "Food Tastings" held last June 6, 2015, at Sarsa. Dubbed "Let's Cook Pinoy," Chefs Sharwin Tee and JP Anglo infuse their very own unique and creative spin on Filipino cuisine. A rich heritage of tradition and a dedicated commitment to quality differentiates the best from the rest, and The Balvenie, one of Scotland's premium single malt whiskies, is a fine example of the handcrafted spirit. Each sip of The Balvenie Range of fine single malts brings the true and authentic taste of the Scottish Highlands, experienced in one special and intimate tasting session at The Fairmont. And you can do just that at the newest branch of Casa Marcos at Il Terrazo. Classic tapas, prepared Casa Marcos style, and an ordinary afternoon just got a whole lot better. The fragrant aroma of grilled meat and seafood on hot charcoal fill the air, as long lines start to form at the entrance of an ancestral home along Pasig's emerging culinary hub. It's a scene that's repeated everyday, going as far back as the early seventies. For over forty years, Three Sisters has seen it all, with the growth of the now popular Kapitolyo as the metro's culinary hub. And that's because its been there from the very start, in fact, it's one of the first restaurants in Kapitolyo. And as the palate of diners continue to evolve, you can always go back to traditional flavors at Three Sisters. Diamond Hotel celebrates the country's Independence Day with a gastronomic feast showcasing the very best of Filipino cuisine. From June 3-14, 2015, the hotel's signature buffet restaurant, Corniche, presents Feasts from the Filipino Kitchen featuring the iconic Lechon by homegrown culinary personality Dedet dela Fuente Santos of Pepita's Kitchen and Diamond Hotel's Executive Chef Marko Rankel's innovative take of Filipino flavors. The Round Table offers a roster of daily themed menus for breakfast, lunch, and dinner buffets for a unique tasting session along the bustling Kapitolyo strip. Sarsa's JP Anglo and Lifestyle's Sharwin Tee come together for an afternoon of local flavors for the second leg of Food Magazines's Food Tastings with their own inventive take on classic Filipino cuisine. Rediscover traditional Filipino all-time favorites from two of the metro's best creative chefs in another afternoon of fun, savory, and creative flavors. The second leg in a series of culinary sessions, Food Tastings by Food Magazine offers loyal readers flavorful opportunities to explore other culinary secrets scheduled this year. To join the second edition of Food Tastings by Food Magazine, check out Food Magazine's FB Page here at https://www.facebook.com/foodmag. Visit Food Magazine's FB Page here at https://www.facebook.com/foodmag for more information. Simple, rustic dishes with bold and upfront flavors is probably the best way to describe Ilocano cuisine, the distinct regional culinary heritage of the north. And a buffet dinner at Hotel Luna's Comedor showcases the best of the north every evening to complete your Vigan experience. Hotel Luna's Chula Saloon Bar offers a daily Merienda Buffet every afternoon, with a variety of sweet and savory treats for that perfect afternoon snack.